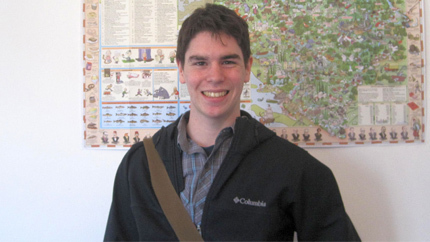 YES Abroad student Daniel Herschlag from Easton, Massachusetts is named the American Abroad Student of the Month for April 2015 for his exemplary work during his exchange in Sarajevo, Bosnia and Herzegovina. Kennedy-Lugar Youth Exchange & Study (YES) Abroad student Daniel Herschlag is the April 2015 American Abroad Student of the Month. Currently studying in Sarajevo, Bosnia and Herzegovina, Daniel’s enthusiasm and persistence has led him to great accomplishments outside his home of Easton, Massachusetts. Since his arrival to Bosnia in mid-August, the language barrier he first faced has not hindered his community involvement whatsoever. Daniel has been volunteering with a local scout troop in Sarajevo where he mentors young troop members and assists local leaders with their weekly events. Accumulating over 80 hours of community service, Daniel has volunteered at a local dog shelter, a local orphanage, and the American Corner, tutoring English to young schoolchildren in Sarajevo. For those who do not speak English, Daniel has had no difficulty communicating. His Bosnian language skills are truly impressive and allow him to easily engage in lengthy conversations with his host mom, neighbors, teachers, and others. Daniel has given a number of presentations at local high schools teaching his local peers about American culture and way of life, as well as the YES program. His teachers nominated him to participate in the Third Banja Luka International Model UN Conference in April and his performance was nothing short of excellent. On behalf of his host school, Druga Gimnazija, he represented Commonwealth of Australia as an advocate on the International Court of Justice. Daniel’s open perspective and behavior towards the exchange program, Bosnia and Herzegovina, and its citizens over the past year have been nothing short of remarkable, making Daniel a true ambassador of the United States. Among all of his accomplishments, his host family commends his positive and gracious attitude and interest in the local culture, history, and way of life. Congratulations, Daniel!